This episode is a little different from what you’ve come to expect. I recently covered the Arizona Psychedelics Conference here in my home state of Arizona, hoping to learn from the insight gained by those who work in the healing world of psychedelic therapies. I had a chance to sit down with three incredible people who work in the field and get their ideas on human consciousness, based on their personal experiences and those with their patients and clients. The first segment is with Kyle Buller, the co-founder of Psychedelics Today. Kyle has a BA in Transpersonal Psychology from Burlington College where he studied the healing potential of non-ordinary states of consciousness by exploring shamanism, plant medicine, Holotropic Breathwork, and psychedelic psychotherapy. We discussed his own Near Death Experience and what he learned about his own consciousness. You can learn more about his practice at www.settingsunwellness.com. What is consciousness? Spirit? Body. Is the body a manifestation of a higher consciousness? The second segment (at 48:50) is with Veronika Gold, co-founder, therapist, and consultant at Polaris Insight Center, San Francisco based clinic providing Ketamine Assisted Psychotherapy We also had a great conversation on her clinic’s therapies, which are important to me, as a survivor of my son’s suicide, and she also shared her insight into human consciousness. The third segment…isn’t here…I fat finger deleted it after the interview. So awful, because my conversation with Dr. Sam Ko was amazing. Dr. Ko is is a Board Certified Emergency Physician and founder of Reset Ketamine (www.resetketamine.com) in Palm Springs, CA. We really got into consciousness, layers of consciousness from the brain to human consciousness to universal consciousness. He really got me thinking and shed new light on my own perception of consciousness. I sure hope I can get back and re-do that interview. So, please enjoy my conversation with Kyle Buller, followed by my interview with Veronika Gold. 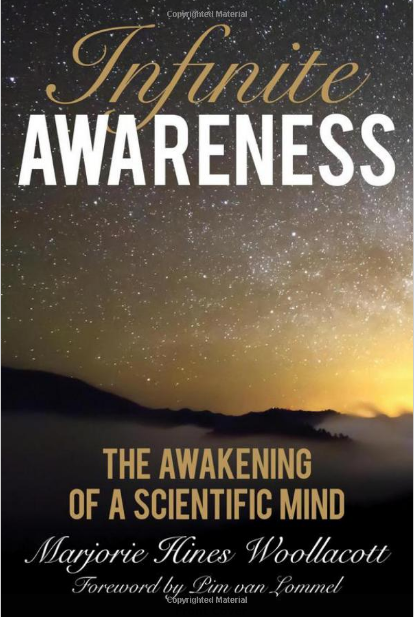 In this edition, I had the pleasure of speaking with Dr. Marjorie Woollacott, author of the book, Infinite Awareness: The Awakening of a Scientific Mind, which she describes as both a scientist’s memoir and a research survey on human consciousness. Dr. Woollacott was a neuroscience professor at the University of Oregon for more than three decades and a meditator for almost four. She also has a master’s degree in Asian studies. Her master’s thesis was the foundation for her book. Her research has been funded by the National Institutes of Health and the National Science Foundation, and includes both research in neuroscience and testing the efficacy of alternative forms of therapy such as tai chi and meditation for improving both attention and balance in adults. We had a great conversation about her studies and experiences around consciousness, meditation, and event psi phenomena. Please enjoy this conversation with Dr. Marjorie Woollacott. Let’s start off with your story: your meditation workshop, the Swami, and how it all played with your being a Neuroscientist. After that experience, you spent time observing your own mind during meditation. What were you able to observe? What did you learn from that? You mention that mantras help to quiet the mind, letting thoughts go, even opens the filters to the non-local consciousness. First, What is non-local awareness or consciousness? How does this relate to paranormal experiences like NDEs? I’m guessing your top-down view of consciousness would mean that consciousness is already out-of-body and these observations are merely new perspectives, filtered down into the mind? Is there a link between paranormal experience and meditation? I’m curious about meditation being a window into consciousness, into my own consciousness, into the non-local consciousness. Is it? Can we exercise, modify, improve our mind/consciousness through meditation? Is there a connection to Robin Cahart-Harris’ (et al) study of psychedelics using fMRI imaging that showed these hallucinogens actually slow down parts of the brain, actually freeing consciousness from the brain’s own filters? If so, how does that play into the top-down architecture of consciousness? You mention that, ‘All this is consciousness’ — can you expand on that? How does it emerge in an individual, conscious being? What about the ‘ego’? Thoughts on that? ‘Self’ is an illusion? You’re a panpsychist? What does panpsychism mean to you — I hear a few different definitions. You’re also an idealist, believing that the mind creates reality? You describe how our nervous system filters all the input it receives, that it must do this. The brain also filters a greater consciousness, non-local awareness (infinite awareness)? Can you expand on that? Can we access this non-local awareness? How does the brain filter this? What’s available to us if we don’t filter it? Can we turn the filter off? [given top-down design model] Does consciousness survive death? Does it change form, or does it persist? In your own studies and in the study of consciousness/awareness/meditation, what about future discoveries or advances excites you? What else will you be working on?